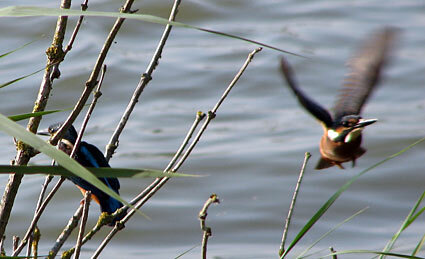 Yesterday we saw our first Common Kingfisher (‘IJsvogel’) in the Netherlands. 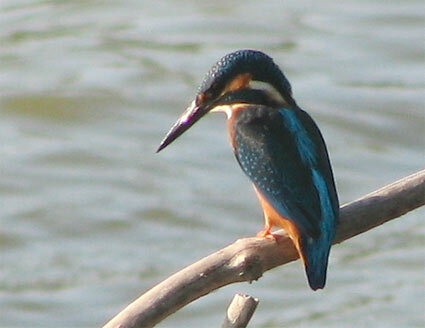 Also known as the European Kingfisher, it is the only Kingfisher in the Netherlands and most of Europe. We had just visited the Vogelfestival (“Bird Festival”) in nearby Oostvaardersplassen, an important nature reserve (see also our visit there in March 2007). We had already seen the Common Kingfisher in India (on 26 April 2006) and 9 different species in other countries, but for a long time I wanted to see one in Holland. Finally seeing these two at such close proximity was an exceptionally nice end to a great birding day that was also my birthday. Earlier on the day we had done a bus excursion as part of the bird fair. It was a two-hour excursion that drove us to some birding locations in the area. The guide on this tour had heard from another guide that two Kingfishers had been spotted near Lepelaarsplassen, but when we arrived there they had already left. Several hours later, when Amy and I were driving home, we stopped at the same place once more to see if the two birds were back. They weren’t at the place where the guide had brought us before, but we walked on for a kilometer to the Lepelaarshut bird hide. Upon entering the hide four other birdwatchers had their scopes and cameras pointed out one side of the hide. 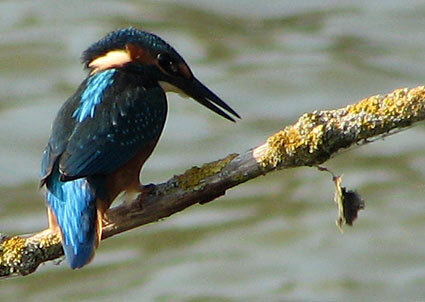 One man whispered to us that there were two Kingfishers perched on a branch nearby. 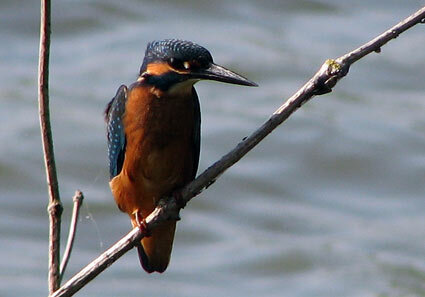 And sure enough, there were two Kingfishers less than 10 meters away from us on two branches. The birds stayed for about 15 minutes, hunting for fish and flying from one branch to another, until a cormorant chased them away. We were very lucky to see these rare birds up close for so long. Every few minutes they dove in the water and picked up a small fish. If the fish was still moving the bird would hit it really hard against the branch until it stopped and then swallow it. This was a lot of fun to see, and the tiny birds ate an exceptionally large amount of fish. This entry was posted on Sunday, August 26th, 2007 at 3:25 pm CET and is filed under Birds, Life in Holland, Nature	with tags birding, flevoland, kingfisher. You can follow any responses to this entry through the RSS 2.0 feed. You can leave a response, or trackback from your own site.